Want to try something new? 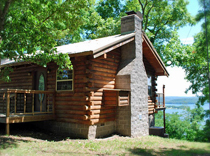 Enjoy our all-season lodging on the lake, the river, or in the woods. Whether for a weekend getaway or an extended visit, Eureka Springs West is an unrivaled Arkansas vacation spot that offers wonderful outdoor views, Beaver Lake and White River activities, and lodging accommodations that vary from simple country comforts to luxurious cabin resorts. Our cabins and cottages have incredible amenities: glass-front walls, indoor fishing, swimming pools and lake swim-decks, restful covered verandas, floating picnic areas, Jacuzzis, fireplaces, water access and private trails for enjoying the outdoors. No matter where you drive, where you stay, or where you play, there is always a chance you will see creatures of the woods, field, and stream. Wildlife! A number of our lodgings are favorite feeding spots for deer. Watching them from your room, balcony or the lawn can be a treat! Discover the magic of being in the Ozark Mountains, where Eureka Springs West is a center of pleasure and fun in the midst of nature’s beauty and serenity. 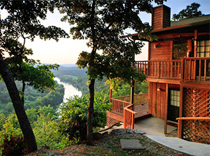 Arkansas White River Cabins are nestled on rock ledges, 450 feet above the White River offering spectacular views. 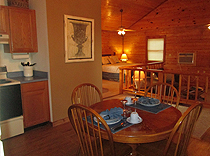 Our comfortable cabins have full kitchens, covered decks, outdoor grills, strong WiFi and Dish Network with Showtime. Eureka Springs is located just 6 miles East on US Route 62. Beaver Lake and Dam is just minutes away. Our real log cabins are found on a dude ranch with 30 acres and lots of horses. The luxury cabins are supplemented by two special suites in the gorgeous horse barn, and we provide an opportunity for trail rides, hiking, and wildlife observation. Weddings, receptions, barn dances, BBQ’s, parties, and business meetings are also a natural with our large meeting room. You can even bring your own horse! These are premiere, luxury cottages and suites. The glass-front, tastefully decorated cottages feature Sleep Number king-size beds, fireplaces, private decks, Jacuzzis, and kitchens. 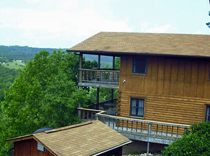 The resort nestles in the woods overlooking Beaver Lake and has both trails and water access. Open all year, we have spectacular lake views from both front and back! Our vaulted ceiling log cabins are nestled in the trees and provide you with luxurious lodging that includes jetted tubs, fireplaces, decks, and kitchens. 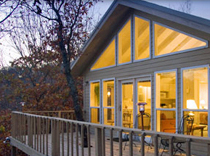 Luxurious, upscale cabins, created just for couples, await you! Indoor amenities include marble showers, Jacuzzis, fireplaces, excellent beds and linens, kitchens, Wi-Fi and HDTV. Outdoors you will find outstanding views of Beaver Lake, both picnic and swim decks, boat slips, pontoon rental, and a heated, indoor fishing dock. 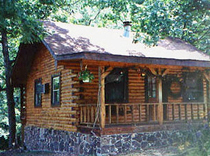 Come rest in our lovely, log construction cabins. They have grills, front and back porches with wooded views, queen beds, full kitchens, electric fireplaces, and Jacuzzis. Located in a wooded setting, they are perfect for getaways and private celebrations. 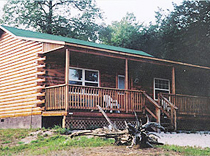 We also have a 2 bedroom/2 bath cabin for families or larger groups. “Catch the fever” at Cabin Fever Resort! “Stay longer, Pay less” policy! 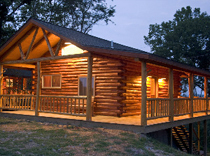 1-5 bedroom cabins and homes, all luxuriously furnished. All units have kitchen facilities and internet service. Other amenities include fireplaces, Jacuzzis, decks and laundry facilities. Some have meeting and reception areas. Located at one of the most beautiful views above the White River, we are a lovely spot for a wedding, officiant available. Stay with us to create awesome memories! 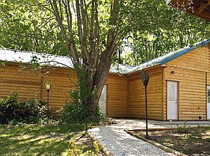 Enjoy comfort in Cabins that sleep 2-10 persons each. 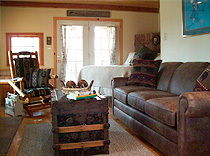 Beautifully decorated in contemporary, rustic elegance, you can just kick back and relax in the beauty of the Ozarks! We have a swimming pool, and each cabin includes a Jacuzzi, a fireplace, kitchen, deck, and secluded woods view. 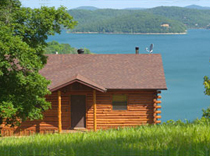 Our luxury log cabins are located right on the waterfront of beautiful Beaver Lake! They come with fully-equipped kitchens, Jacuzzis, and fireplace. Each cabin has a deck with spectacular lake views. You will appreciate the comfort of the cabins, but can also enjoy the refreshing outdoors and use our boat dock or swimming/fishing deck. We provide a wonderful setting for weddings, and will do everything possible to make your vacation a memorable experience! 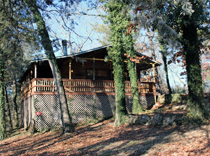 Little Cabin in the Woods is a private guest cabin nestled on 17 acres on Beaver Lake. It is a short stroll to the shoreline and dock or if you prefer, sit on the covered porch and view the lake. The surroundings are inviting and peaceful as you listen to the songbirds or catch a glimpse of the deer in the early mornings or late afternoons. Premier Rustic Log Home on the WHITE RIVER. 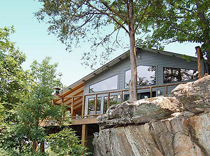 Located on 5 acres with fantastic views of the Amazing Ozarks! Fishing guide, shore cooking, kayak rentals and river frontage available. Located in an amazing setting near Beaver Lake, we provide cabins, full RV hookups, a convenience store with fishing supplies, and an ordained minister is available for small weddings. We have many trails for a fun outdoor experience on our beautiful and tranquil grounds. Our resort is family owned and operated, and provides a perfect setting for family vacations or a charming wedding. 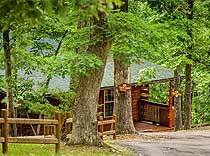 Our 19 wonderful cabins are found on 40 acres along the White River. Kids and pets are always welcome! We abound with picturesque scenery and are located just 1/2 mile from Beaver Lake. Open 8-5 all year, we also provide fishing guides and jon-boat, river boat, kayak, raft and canoe rental to help put the fun in your vacation. ...where life is sweet! Our peaceful and relaxing setting consists of romantic, boutique luxury log cabins nestled in a forested clearing on 40 acres with hiking & walking trails. Each cabin enjoys a private pergola-covered patio. Each spacious cabin is large, beautifully furnished and well-equipped. We have luxury linens, Jacuzzis, kitchenettes, trails, grills, a fire pit and more. Our “Sugar Shacks” provide the perfect atmosphere to take you away from your daily routine. We are located high above Beaver Lake, with expansive and awe-inspiring views. 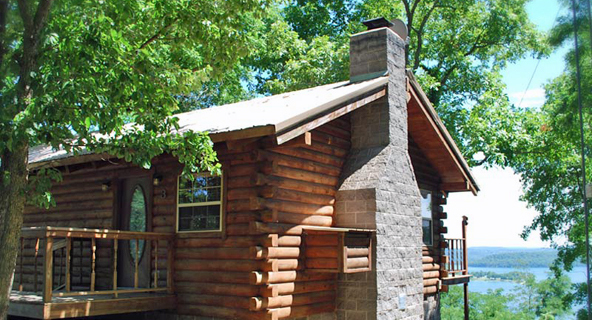 Situated on a 75-acre mountaintop, our log cabins sleep 2-14 each. You will enjoy both sunrise and sunset vistas, a 180-degree view of Beaver Lake, and all the lodging comforts imaginable. Fishing guides are available, and trails are nearby. 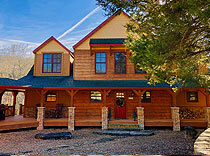 Enjoy luxury log cabins with fireplaces, decks, Jacuzzis, and great privacy!